Cengage Learning EMEA. PAPERBACK. 1408041804 New Condition. . New. Cengage Learning EMEA. PAPERBACK. 1408041804 Like New Condition. . Fine. 2012-02-09. New. Ships with Tracking Number! INTERNATIONAL WORLDWIDE Shipping available. Buy with confidence, excellent customer service! 2012-08-04. New. Ships with Tracking Number! INTERNATIONAL WORLDWIDE Shipping available. Buy with confidence, excellent customer service! 2007-09-04. New. Ships with Tracking Number! INTERNATIONAL WORLDWIDE Shipping available. Buy with confidence, excellent customer service! 2006-12-15. New. Ships with Tracking Number! INTERNATIONAL WORLDWIDE Shipping available. Buy with confidence, excellent customer service! 2015-01-13. Good. Ships with Tracking Number! INTERNATIONAL WORLDWIDE Shipping available. May not contain Access Codes or Supplements. May be ex-library. Shipping & Handling by region. Buy with confidence, excellent customer service! Cengage Learning EMEA. PAPERBACK. 1408093936 Expedited shipping NOT available. Brand New. Exceptional customer service. Standard shipping is ground. All deliveries in 4-14 business days. . New. 2004-05-13. New. Ships with Tracking Number! INTERNATIONAL WORLDWIDE Shipping available. Buy with confidence, excellent customer service! John Wiley & Sons, 1985-05-31. Paperback. Good. 2006-12-15. Good. Ships with Tracking Number! INTERNATIONAL WORLDWIDE Shipping available. May not contain Access Codes or Supplements. May be ex-library. Shipping & Handling by region. Buy with confidence, excellent customer service! Cengage Learning EMEA. PAPERBACK. 1473748879 Expedited shipping NOT available. Brand New. Exceptional customer service. Standard shipping is ground. All deliveries in 4-14 business days. . New. Cengage Learning EMEA. PAPERBACK. 1408093936 Brand new book. Ship from multiple locations. 3-5 business days Express Delivery to USA/UK/Europe/Asia/Worldwide. Tracking number will be provided. Satisfaction guaranteed. . New. Thomson Learning, 2000-03-01. 5th. Paperback. Used:Good. Cengage Learning EMEA, 2012-03-16. Paperback. Used:Good. Thomson Learning, 2000-03. Paperback. Good. Cengage Lrng Business Press, 2007-12-17. 7. Paperback. Used:Good. 2000-03-01. Good. Ships with Tracking Number! INTERNATIONAL WORLDWIDE Shipping available. May not contain Access Codes or Supplements. May be ex-library. Shipping & Handling by region. Buy with confidence, excellent customer service! Cengage Learning EMEA. PAPERBACK. 1473748879 Brand New ,Original Book , Direct from Source , Express 5-8 Business days worldwide Delivery. . New. Cengage Learning EMEA. PAPERBACK. 1473748879 Brand New ,Original Book , Direct from Publisher , Express 5-8 business days , worldwide delivery. . New. International Thomson Business, 2006-12-01. Paperback. new. black & white illustrations. Management and Cost Accounting, 6e Value Media Edition offers the student an extensive set of learning resources to help reinforce learning from the book and get extra practice, and now includes these additional FREE resources for students: NEW! - Downloadable Student 's Manual NEW! - Downloadable Guide to Excel NEW! - Spreadsheets of Key Examples NEW! - PowerPoint Slides NEW! - Real World Views The market-leading European text on management accounting and comprehensive authority on all aspects of the subject has been streamlined and substantially redesigned in its 6th edition to make it even more suitable for the needs of today 's student. 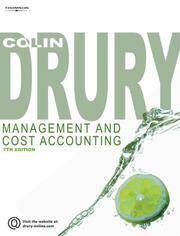 The aim of the new edition is to explain the principles involved in the design and evaluation of management and cost accounting information systems. The emphasis in the book is on management accounting systems that will be used for internal decision-making purposes within an organisation, however, cost accounting systems for external reporting are also comprehensively covered. It has been brought up to date with the latest developments in the subject. Having been made stronger pedagogically with the addition of the answers to the questions and more real-world mini cases, the text brings home the relevance of the subject matter to the real world of business. 2012-02-09. Good. Ships with Tracking Number! INTERNATIONAL WORLDWIDE Shipping available. May not contain Access Codes or Supplements. May be ex-library. Shipping & Handling by region. Buy with confidence, excellent customer service!